The newest addition to the GVL Homepage the pictorial account of the GVL's yearly get together.~Warning~ This page may take a few minutes to load due to the size of the pictures. Includes Giants pictures sent to us from GVL Regulars and Giants fans. ~Warning~ This page may take a few minutes to load due to the size of the pictures. Are you going to miss The 'Stick? Vote here and see your results instantly. This month Gus recaps his Top Ten Deep Thoughts for the 1998 season. A NEW "Giants Forum" give you a chance to post messages about the Giants, the GVL, the GVL Homepage, or baseball in general. Speak up and let us know what you think! This page contains Bios of all GVL Regulars who have provided their information to us. Arizona Fall League update JUST ADDED! Check out the stats of your favorite minor leaguers and future Giants stars on the AAA Fresno Grizzlies. This page is updated by GVL Regular: Ron from Fresno. Please send in your pics and comments about the event. 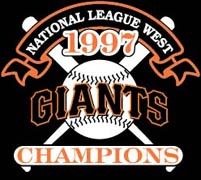 This page has been updated to include: Trade information, a link to the Pac Bell Park Web Cam, player transactions, 1998 Draft info, a Link to the Real Audio Schedule, the Giants '98 schedule, give-away days at the 'Stick and anything else we think you should know! Here you can find recaps of the 1998 season including, game scores, Giants record and GVL Players of the Game. The GVL Homepage is a work in progress. REMEMBER THIS IS YOUR PAGE!!! So take part is helping us create the best Giants website for the best Fans around. Don't forget to sign the Guestbook and let us know what you think!! !